If you didn't already know, we're Mazda3 devotees. Not because it's a powerful car or because it's expensive. In fact, we consider the Mazda3 to be one of the best (if not THE best) cars for the money in terms of style, quality, driving excitement, fuel economy, tech, safety, and reliability. It just seems to do everything remarkably well. And now with the unveiling of the 2019 Mazda3, things get even better. 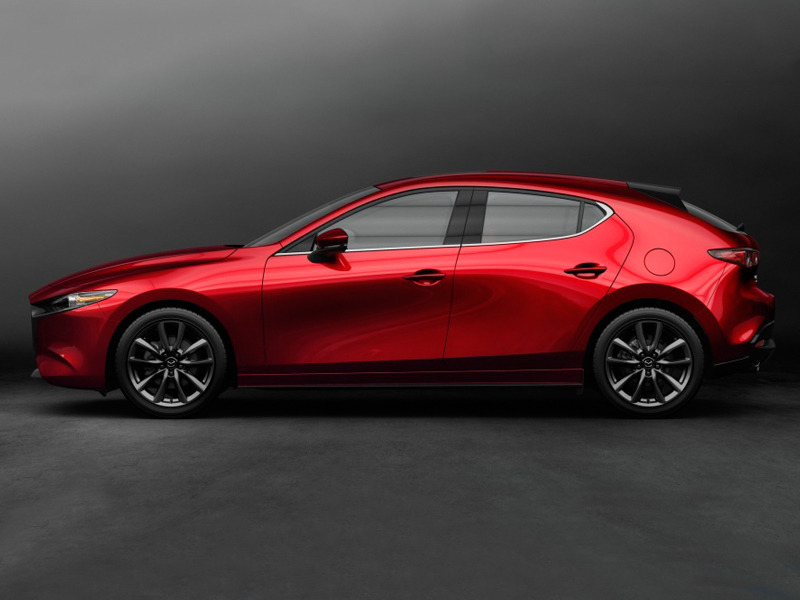 Take a look at the new 5-door hatchback and sedan, and you can see that Mazda wants to go upmarket. Yes, the 2019 Mazda3 is a head-turner. You'd never guess it was affordable. If you follow Mazda at all, you'll see that the new Mazda3 5-door looks almost exactly like the beautiful Kai Concept that was introduced in the fall of 2017 at the Tokyo Motor Show. That car was rumored to be the groundwork for the new 3, and now we can see how much of the concept was captured in the 2019 car. It's not as aggressive as the concept in terms of the greenhouse angles and the stance, but it's damned close as you can see below. It borrows the rounded rear shoulders and the deep body sculpting while keeping the long hood and rounded greenhouse of the current 3. The fact that the back end eliminates virtually all panel seams for a near-perfectly smooth tail section. The fascia is almost identical to the refreshed Mazda6, and the taillights with the shrouded top edge giving a sinister rear view. The sedan looks just like a shrunken Mazda6, and that's a good thing. The sedan is almost as fetching as the 5-door hatchback. Though it lacks the hatches rounded rear shoulders, the tail section's treatment is truly handsome thanks to similar slender dual-circle shrouded taillights that are set deep into the rear fascia, a prominent spoiler that's incorporated into the trunklid, and those signature twin round tailpipes. Now that's a good looking back end. The front 2/3rds is essentially identical to the 5-door, but the overall look of the sedan is now much different from the 5-door, unlike the current 2018 versions. The rear treatment of the sedan now makes it a tougher call as to which model to choose. Though we're still partial to the 5-door, we think the sedan looks better than ever. Just as important as the exterior are the new power options. Mazda will offer five engines (probably not all of them will be offered in the U.S.), including 1.5-, 2.0-, and 2.5-liter Skyactiv-G gasoline engines, as well as the 1.8-liter Skyactiv-D. Mazda engineers have tweaked all the engines for performance and efficiency. There will also be a new four-cylinder Skyactiv-X engine, which shows off Mazda's latest powertrain innovation that uses spark-plug-controlled compression ignition. If you have no idea what that means, it's essentially a system that uses a spark to ignite a small and very dense amount of the fuel-air mix in the cylinder (like a conventional gas engine). The internal temp and pressure are increased as a result, and the rest of the mixture ignites under pressure like a diesel engine, which burns faster and more fully than traditional gas engines (see video above). This maximizes efficiency and power. It's brilliant and an important move for gas engine technology, when other automakers are focusing on hybridization and electrification. The biggest surprise to us is the addition of i-Activ AWD. It's not just an AWD setup but one that has performance leanings with four-wheel vertical load detection paired with G-Vectoring Control Plus to control torque distribution between the front and rear wheels. The car's composure in emergency situations, bad weather, and high-speed lane changes is supposed to be much improved, as a result. No mention of which engines will get the AWD offering, but this is huge news for those in wetter/snowier climes, as well as those who have steered away from the 3 because of its FWD setup. And because Mazda cares about driving enthusiasts perhaps more than any mainstream brand, they're keeping a manual transmission for the 3. Boo yah! And to bolster their zoom-zoom image, the 3 now gets a stiffer body with 10 times more ultra-high-strength steel, and an updated suspension that reduces noise and aids the ride comfort. Mazda did shift from a rear multi-link setup to a torsion beam. We'll see how that alters the handling. Rumor is that the change aids in a quieter ride, a previous criticism of the 3. The interior is an improvement over the current car's already stunning and award-winning cabin. It's more refined, cleaner, and with an airier look and feel. Mazda studied human mechanics, and the result is flatter surfaces, cleaner lines, and a more wide open expanse. You'll notice that especially in the long swath of leather in the dash that extends from the door to the instrument binnacle. The steering wheel spokes have been slenderized, control buttons are now set up in linear fashion. The dash is now layered with the HVAC vents set lower and made thinner, giving the interior a wider appearance. Even touches like a clear overlay on the center console's black trim gives it a richer, deeper look. The old 7-inch infotainment touchscreen gets upgraded to a big 8.8-inch unit with a new menu that's more intuitive and easier to control. No word on whether you'll be able to operate it while driving since the current car only lets you use the control knob in the center console (now bigger, as you can see below). Sound deadening is supposed to be much-improved thanks to a two-wall body structure, fewer carpet openings, and a better headliner and floor mats. The stock and premium audio systems' speakers have been moved for optimal sound, too. These guys thought of everything. The 3 also gets little but important changes like more contoured seats to hold the body's natural "S" seating position, standard knee airbags, and optional front cross traffic alert, a driver alertness monitoring system, and adaptive cruise control with stop-and-go capability. Windshield washer fluid now emits from the actual wiper arms just like Volvo's nifty version. A nifty feature that hasn't been thought of yet (as far as we know) is the Mazda Connect digital owner's manual, that uses the car's warning lights to indicate the priority level of any fault and then link directly to the proper section in the digital owner's manual. No official pricing has been announced yet, but we do expect it to climb a bit from the 2018 model, given the vast number of improvements in the new car. It will still be a ton of car for the money and one of the best buys in the auto industry, not to mention one of the best-looking, best-driving cars around.